Jacob Czypull, 14, is one of 10 finalists in the Grades 7 to 9 category of The First Page student writing challenge. Cat and Mouse by Jacob Czypull is one of 10 stories shortlisted for the The First Page student writing competition in the Grades 7 to 9 category. Students across Canada wrote the first page of a novel set 150 years in the future, imagining how a current-day trend or issue has played out. Nearly 2,400 students submitted their stories. 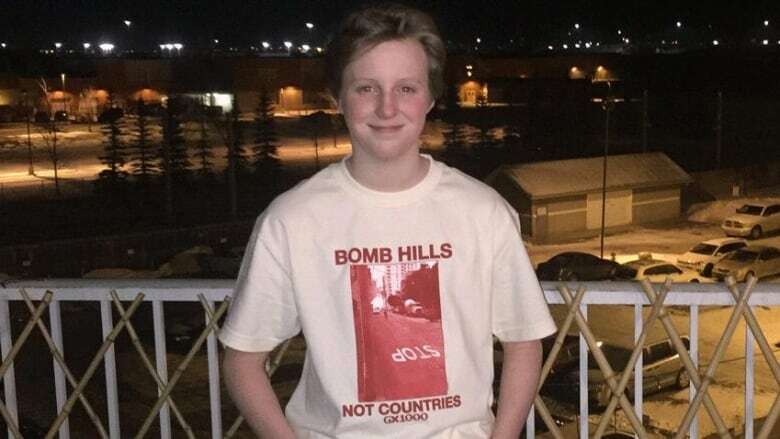 Czypull, a student at Blessed Cardinal Newman School in Calgary, Alta., tackles medical marijuana and the possibilty of World War Three in Cat and Mouse. Mother was getting ill, I had to take the risk. The medical marijuana had run out and the pain of the past would hit soon. Ever since the war had sent us underground when I was a baby she had needed the marijuana. It helps her get through the panic attacks and trauma. Maybe she likes the high, but that's not my place to say. More marijuana meant I had to go outside. The ruined city of Atlanta sprawled out around us after World War Three hit. It was a wasteland. I slung the rifle over my shoulder and started walking up the long and convoluted staircases to the surface. Of course the rifle didn't have any bullets, those were gone 10 years ago, it was just a threat. Most people didn't have bullets but why would one take the risk? I used to get lost in the staircase to the surface, built to confuse intruders if they ever found our home, but now I know it like the back of my hand. After five minutes of climbing the worn concrete steps, I found the surface. Downtown Atlanta was just a huge game of cat and mouse. I just hoped today I wasn't a mouse. Our home was near the old Georgia aquarium. Once I got to the aquarium, it was only a 10 minute walk to Jamie's bunker, but those 10 minutes were hell. Jamie was in the military but quit after he realized how bad the war truly was. He thought it would've been better to run than to fight. He was incredibly respected and almost nobody messed with him. He had his own underground farm and therefore the marijuana. I respected and looked up to him and I'm sure he didn't mind me. He tried to act tough but I know there was a soft spot somewhere in him. My mother and him had been friends before the war and she had gotten the marijuana for free because of that. Out here, it is good to have connections. I climbed out of our secret pothole cover and looked around. This was the time. To successfully get around you needed to use a delicate balance of speed and secrecy. Like a thief running through the night.